The beginning of the CSA season seems to mean a lot of greens and lettuces. A lot. Seriously, I had no idea there were so many kinds of lettuce! It’s crazy! Anyway…In trying to find ways to use lettuce that aren’t a salad, I found lettuce wraps! My first attempt at lettuce wraps for this year was an absolute success. I was able to use the lettuce and one of the kohlrabi from the CSA box, which was nice. Brian and I both LOVED this recipe (except that after one lettuce wrap, he grabbed some flour tortillas out of the fridge and made Thai Steak Burritos). The sauce would be killer in a stir-fry, too. 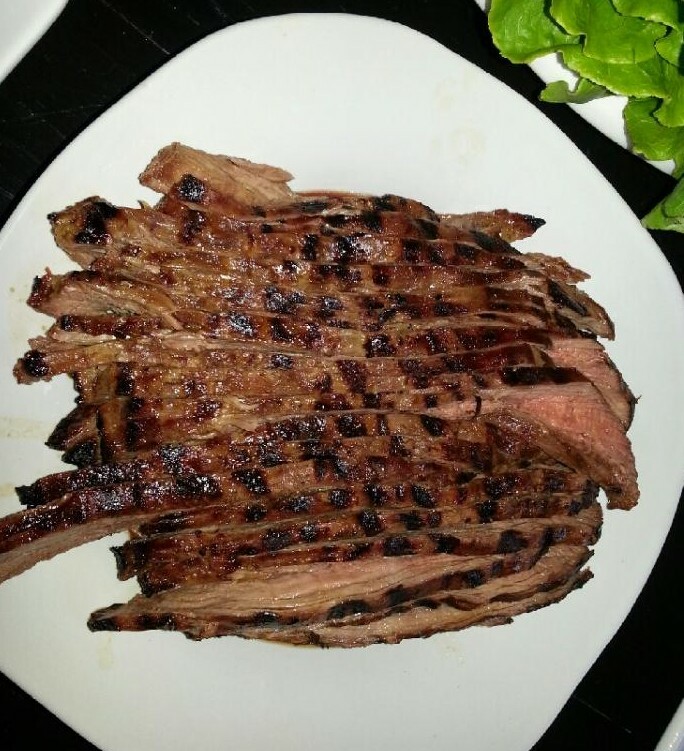 Grilled sliced flank steak is possibly my favorite food, and this marinade was awesome. I found this recipe at Iowa Girl Eats, and I pretty much followed it. I sliced a kohlrabi into matchsticks and added that to the quick pickled onions and cucumbers, and it’s possible that I may have used more garlic than the recipe calls for. Probable, even. 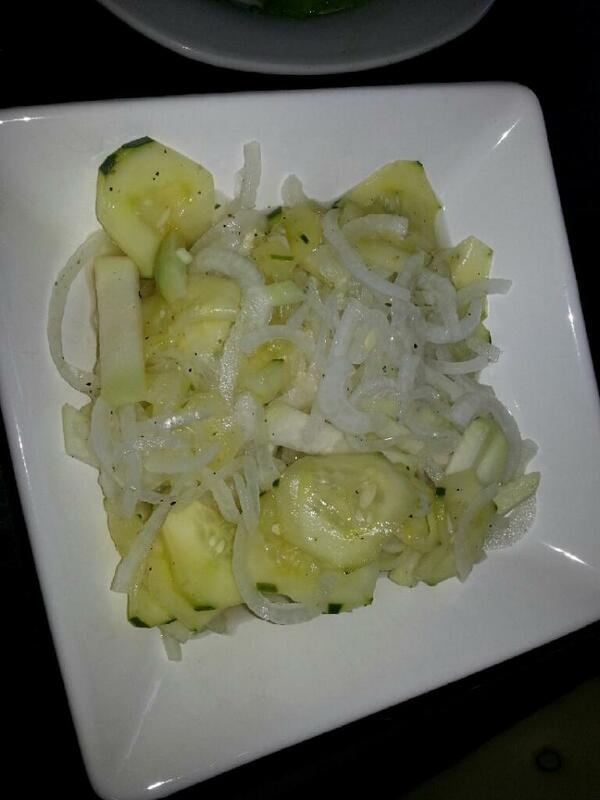 Quick pickled onions, cucumbers and kohlrabi. Yum! I also sliced some avocado to add to the lettuce wraps. It was a nice blend of textures and temperatures – the hot steak, cold crisp pickles and cold creamy avocado…I wish there would have been leftovers! For the Quick-Pickled Veggies: combine ingredients in a large bowl then stir to combine. I mixed everything in a large Tupperware container and let it sit in the fridge for about 6 hours before dinner. Every now and then I shook the container to stir it all up. Combine soy sauce, lime juice, olive oil, honey, sesame oil, red chili pepper flakes, ginger, and garlic in a blender or food processor then blend until smooth. Remove 1/4 cup of the liquid and pour into a large ziplock baggie with the flank steak to marinate. Add almond butter to the rest of the liquid in the blender and blend again until smooth. Because I put this together in the morning, I poured the sauce into a bowl and covered it with plastic wrap. I put the sauce in the fridge until dinnertime. If you put the steak in the fridge to marinate, take it out and let it come to room temp before grilling. Grill the steak to medium rare. 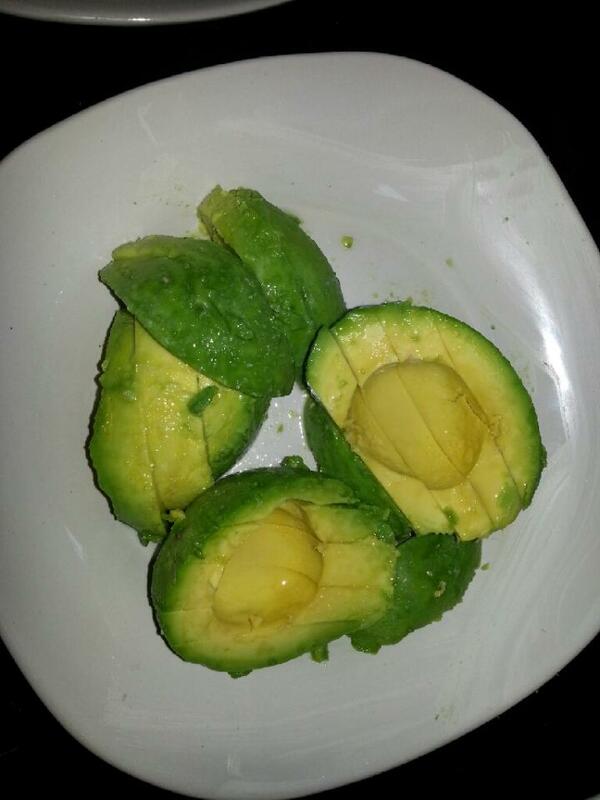 Let it rest for at least 10 minutes, then slice thinly. Assemble lettuce cups – steak, pickled veggies, avocado and sauce. (Or wrap it all in a tortilla.) Eat and enjoy! 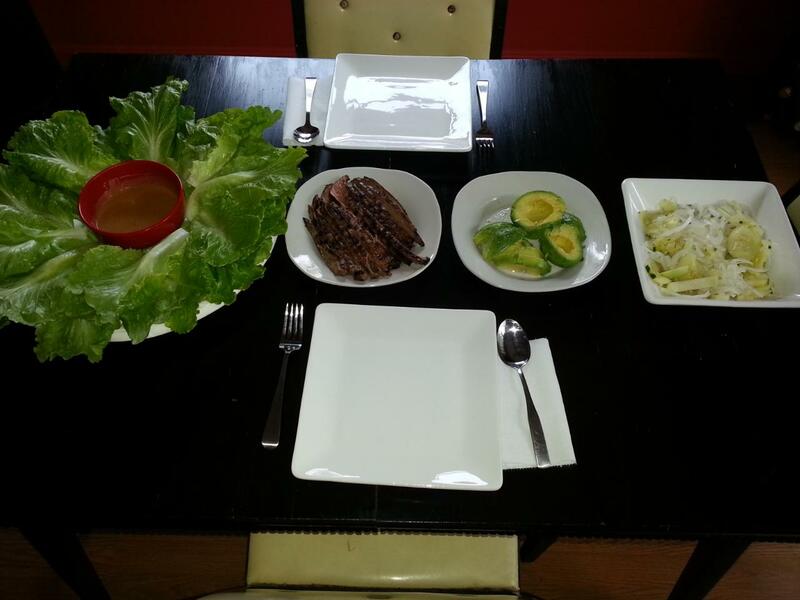 This entry was posted in CSA, Dinner, General, Recipe and tagged flank steak, kohlrabi, lettuce wraps on June 28, 2013 by Melissa. This looks terrific–I hear ya on tons of lettuce (Meghan has a great post about that at Clean Eats) but good for you for the lettuce wraps. I like how everything is laid out on the table, ready to go, and both the quick pickled veggies and the marinade sound delicious. Thanks! Thanks, Kirsten. I was skeptical about the quick pickled veggies, but they turned out great! Beautiful place setting, and you can never have enough garlic. Never, ever. I did lettuce wraps too and while clever, it didn’t use nearly enough lettuce for me. Ha. I’ve been doing big salads all week for lunch and I think I managed to polish off an entire head and a half of lettuce. I bet your lettuce is like mine too: huge! Am I right? Yep! And I got a couple more gigantic heads of lettuce yesterday. I’ll have to make a big salad or two this weekend. I love using lettuce wraps in the summertime. These look terrific. That looks beautiful. And, healthy! I need to try lettuce wraps. I have never done that! Thanks, mom! You could add some grilled veggies to make meatless wraps for yourself. Yummy! We have never made lettuce wraps at home, which now seems ridiculous to me! I had delicious chicken and veggie ones in that restaurant by the Cedar Lee Theater- Lemongrass. So delicious! I love flank steak too- especially from Duma’s Meats. We have too much lettuce too from our CSA but no bibb lettuce! This seems like a good recipe for Kim and I to tackle together- he can grill the steak and I will cut up the sides. Thanks so much! Thanks! I think Uncle Kim would like the sauce on these.